STANFORD, CA - April 19, 2014: Stanford vs Arizona State at Klein Field, Sunken Diamond Stadium. Stanford won 1-0. 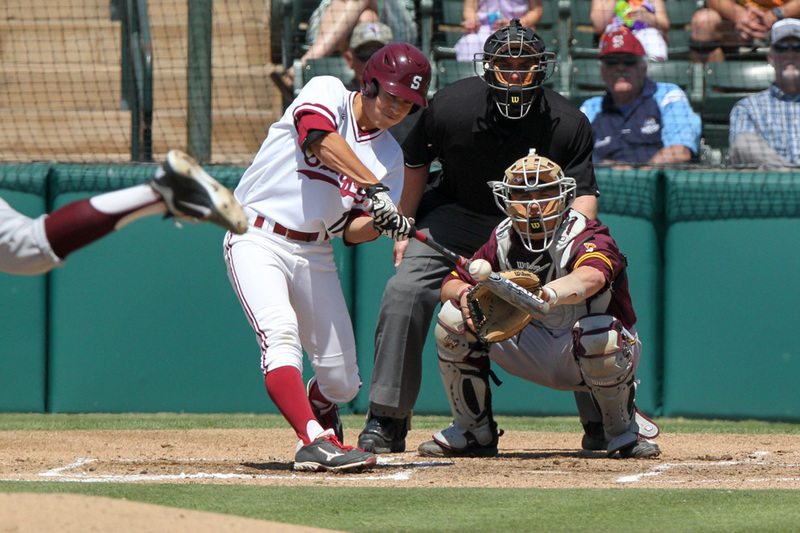 Stanford baseball is looking for its 2016 campaign to be one of transformation and resurgence. Coming off of a disappointing 24-32 season in 2015 and a 10th-place finish in the Pac-12, the Cardinal are hoping that the 11 freshmen that they recruited to The Farm this season, a healthy roster and a slight change of scenery at the newly-renovated Sunken Diamond can fuel a surge back to the top of a loaded Pac-12 conference. “There’s a little bit of a fire lit beneath the guys,” says rehabbing ace Cal Quantrill. 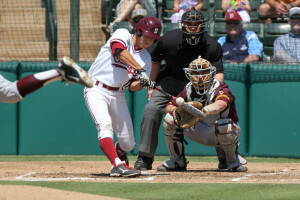 “Stanford baseball is not a seventh-in-the-Pac-12 team. That’s not what we are and that’s not what we’ll ever be. We were last year because of unfortunate circumstances, but I don’t think any of us see ourselves as a team that’s in the bottom of the Pac-12. But even in a season that hopes to be marked by change, Stanford still embraces the things that stay the same year after year as well – most notably, its fearless leader, manager Mark Marquess, for whom this season will mark his 40th year at the helm of the program. “God, I’m old,” Marquess said with a smile. “But it feels good to see all these changes and to see where college baseball has come since when I started in 1977. Another thing that’s stayed the same throughout the years has been Marquess’ steadfast dedication to subjecting his team to one of the most grueling and difficult schedules in the nation, and the 2016 campaign will be no different. Twenty-seven of the Cardinal’s 54 regular-season games will be contested against teams ranked in D1Baseball.com’s preseason top 25, and even Marquess admits that the schedule will likely be one of the team’s most formidable challenges in the early goings of the season. According to Marquess, the key to making a successful route through a collegiate baseball season lies with the pitching staff, and luckily for him, Stanford’s rotation and bullpen look both deep and healthy to start the season. Although Quantrill and fifth-year senior John Hochstatter are both recovering from Tommy John surgeries and will likely not see action until April, the Cardinal are thrilled about a duo of freshmen that they believe can make an immediate big impact: Tristan Beck, who was seen as a surefire first-round MLB Draft pick had he not committed to Stanford, and lefty strikeout artist Kris Bubic, who punched out 82 hitters in 70 innings in his senior season of high school. Although Marquess has not named an opening day starter, he has confirmed that his rotation will consist of Beck, Bubic, junior lefty Chris Castellanos (who saw lots of success after converting from a reliever last season) and junior righty Brett Hanewich, who recorded a 4.00 ERA as the Cardinal’s Friday starter last season. In the field, Marquess noted that pretty much every position still has ongoing competition that will persist through the non-conference season, and that junior Tommy Edman is the Cardinal’s only starting position player currently set in stone. “We’ll hopefully narrow it down as we get closer to the Pac-12 season opener towards the end of March,” Marquess said. Edman, who was the only Stanford player to start and play in every game last season amidst a rash of injuries, will anchor the infield and move from second base to his natural position at shortstop. Much like last season, the catching duties will be contested between sophomore Bryce Carter, junior Alex Dunlap and junior Matt Decker. Marquess has not yet ruled out a platoon at the position. Meanwhile, first base will be a competition between incumbent starter Matt Winaker, senior Austin Barr (who can also catch and DH) and freshman Nick Oar. Second base and third base will be some combination of sophomore Mikey Diekroeger, one of Stanford’s hottest hitters from last season, and freshmen Nico Hoerner and Duke Kinamon. Because Stanford’s infield depth has increased substantially from last season, sophomores Beau Branton and Jesse Kuet, who saw a lot of playing time last season, will have to be more flexible this season but will still see a substantial amount of action, according to Marquess. “They’ll still be able to play in the infield, but they’ll probably have to move into left or right field to get into the game because of their bats,” Marquess said. The outfield seems pretty set for the time being, with sophomore Quinn Brodey, junior Jack Klein and senior Jonny Locher set to reprise their roles from the end of last season from left to right. Marquess also singled out freshman power bat Brandon Wulff as a new face that could see action in the outfield as well. For a Stanford lineup that struggled at the plate at times last season, combining to hit just .253 and slugging just .337 as a team, Edman believes that the young lineup from last year could be poised to take a huge step forward with a full offseason of experience under its belt. “All the freshmen got to play summer ball for the first time and get so many more at-bats against college-level pitching in high-quality summer leagues,” Edman said. “It’s definitely huge for all the freshmen and even sophomores, too, to get that much more experience, and it’s definitely beneficial. In the end, even with most of his position players returning with a year of experience and his pitchers having high ceilings, Marquess still seemed cautious in his preseason prognostications, pointing specifically to Oregon State, Cal, UCLA, USC and Oregon as the teams that he expected to do well in the conference this year. But as Cal head coach Dave Esquer said during his time at the podium, it would be dumb to sleep on a Mark Marquess-coached Stanford team. If this edition of the Cardinal can stay healthy, the talent is absolutely there for Stanford to surprise the nation and come out with a big run, especially if Quantrill can make good on his prediction that he’ll be back “at 110 percent” in April. Stanford will open its 2016 campaign on Friday when it hosts No. 21 Cal State Fullerton for a 6 p.m. first pitch at Sunken Diamond.